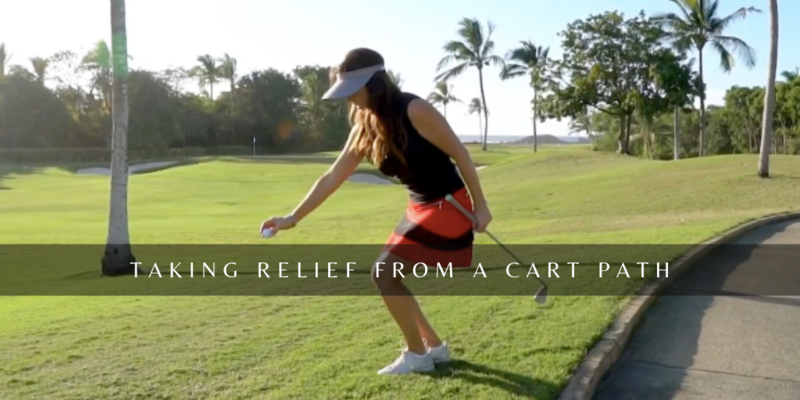 The procedures for taking relief from a cart path have changed a bit in 2019, but not just because you need to drop from knee-height. Yes, the height from which you need to drop is now at the level of your knee when standing (though you don’t need to be standing upright to take your drop). But in addition to that there are slight changes to the terminology. “Reference Point”, “Relief Area”, and “Complete Relief” are key terms you will want to know when dealing with an immovable obstruction such as a cart path or sprinkler. “Abnormal Course Conditions” include Immovable Obstructions, Dangerous Animal Conditions and Embedded Balls. (IMPORTANT: Most likely you will utilize the driver to measure that one club length because you must use the longest club EXCEPT the putter). Now taking free relief from a cart path is where a lot of players get into trouble. They want to pick their “nicest point of relief” instead of their “nearest point of relief”. If you do that and play from the wrong place, you could earn yourself a two stroke penalty.